In this example integrate with a database Table in Decisions. This table containsID, First Name, Last Name, and Email Address	fields. 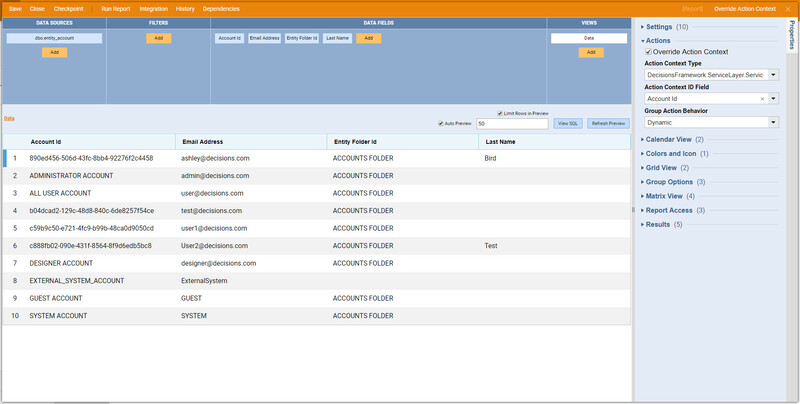 Begin by creating a Report on the External Table with the ability to pull Account Information and Actions	by clicking Report Data. 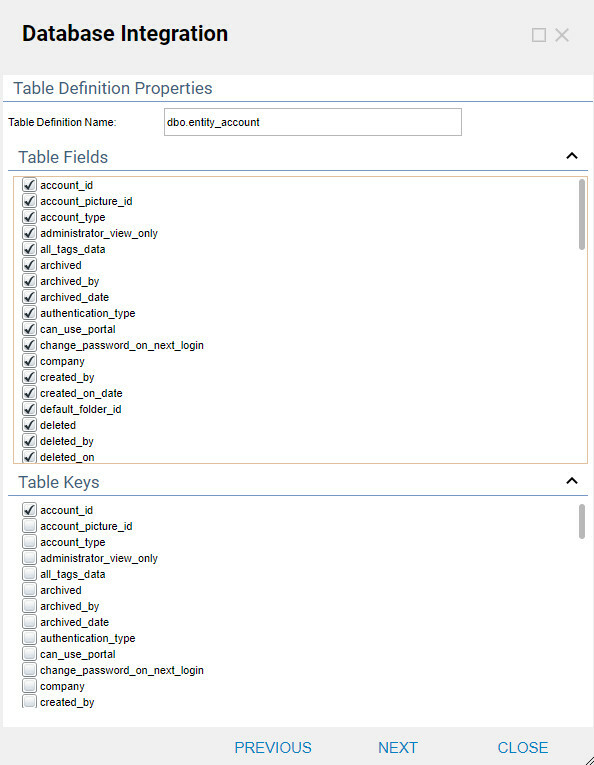 ID	field in the external Table is matching Account Id	in Decisions. Start with Adding a database Table. 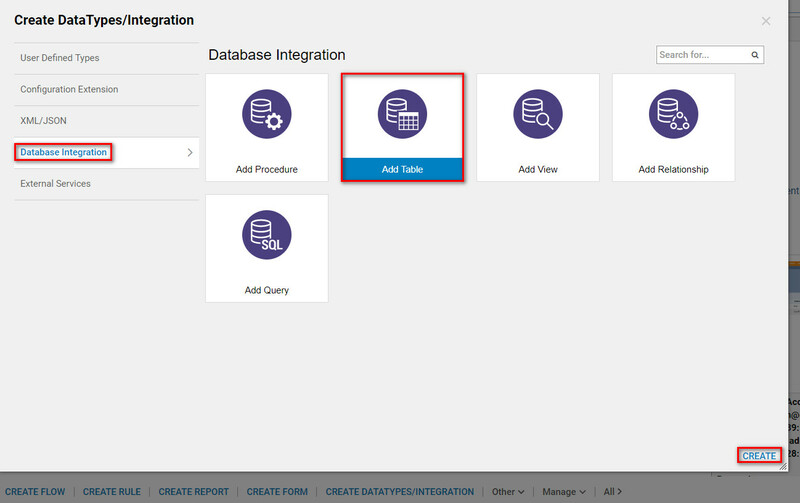 In the Portal, navigate to the Designer Folder and choose Add Table	from Datatypes/Database > Database Integration	category on the Folder Actions Panel. 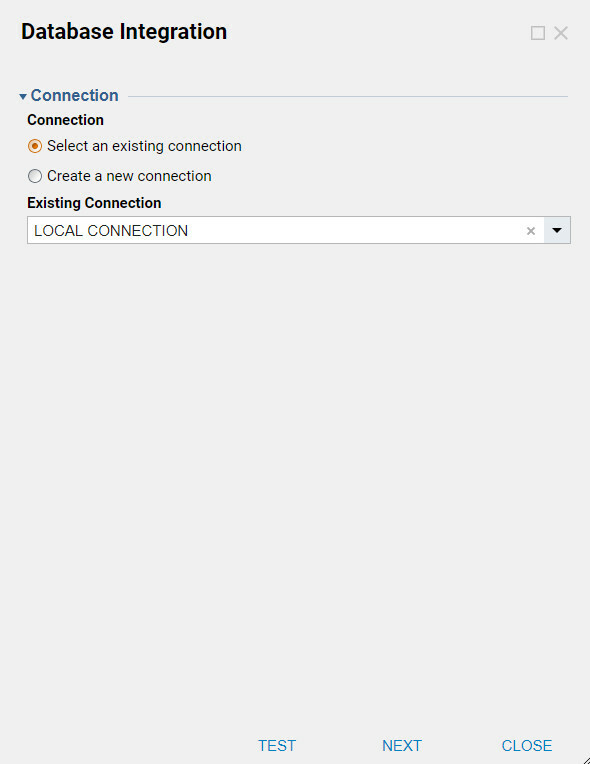 Choose an existing local connection or create a new database integration. For this example, a local connection is selected. 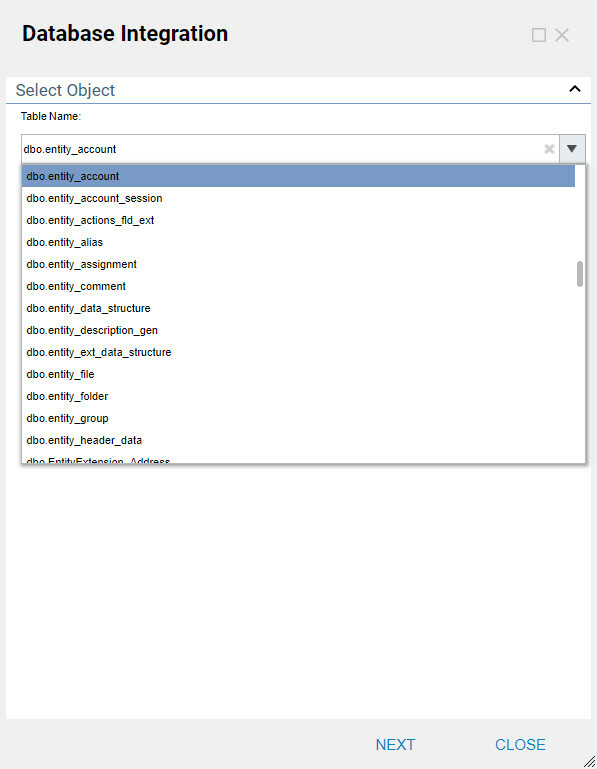 Select an internal Database to Integrate with. Choose dbo.entity.account	for this example. Select a Table	from the Table Name	drop-down list. Next, choose from the Fields	available. The Feilds that are selected will generate for this Table integration. Select a Table Key choose Next	to save the table integration. Back in the Designer Folder we click Create Report/Page > Create Report	on the Folder Actions Panel and Name	the Report and click Create	to proceed to the Report Designer. In the Report Designer add the Integrated Table	as Data Source	for our Report . 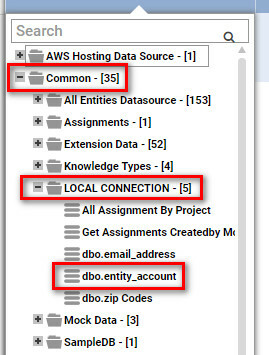 We expand Data Sources > Common > SampleDB	and add dbo.Emails	table as Data Source. Next, we add desirable columns from our Data Source to populate Report with Data	. Add Actions To The Report Data on	a report. 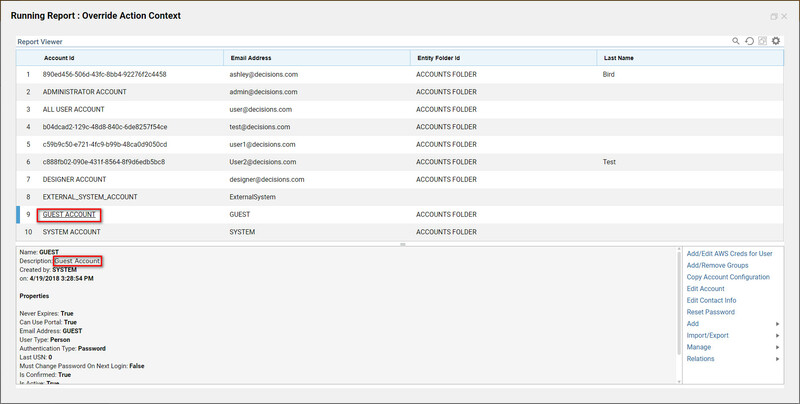 This can be done with theOverride Action Context	feature located in the Reports properties tab. At this point, if we save our Report and Run	it, we will not have any Actions	on our Data	. 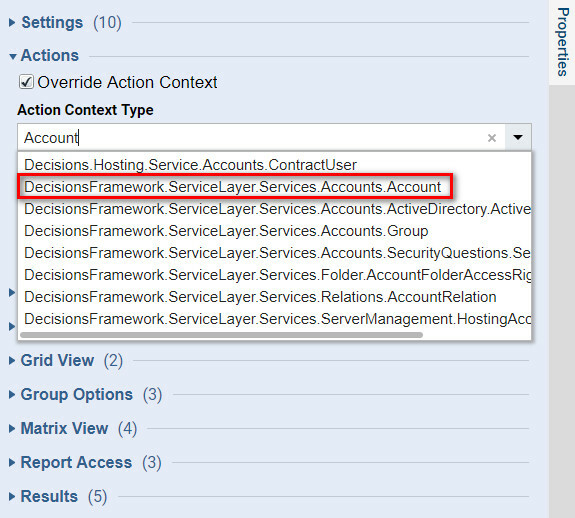 To add Account	actions to our Data we check Override Action Context	check-box in Report Configuration Settings > Actions	category. Expand the properties Tab to make sure each Action can be read in the drop-down. 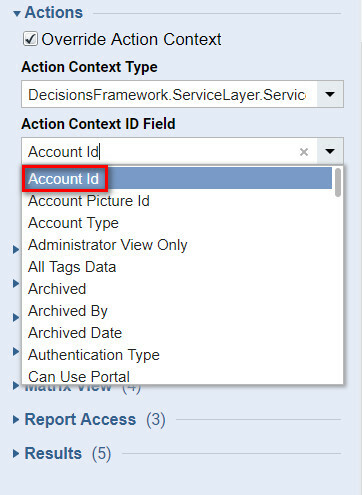 Then, in Action Context Type	we search for ‘account’ and pick DecisionsFramework.ServiceLayer.Services.Accounts.Account	type. 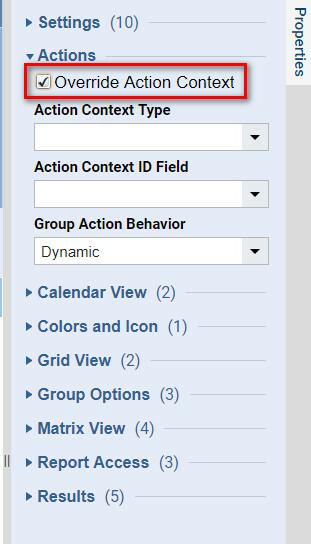 Next, from the Actions Context ID Field	drop-down, we pick ID	column. And this completes our Report design. We can save Report and close Report Designer. Locate Run Report	from the orange action panel at the top of the report and select Run Report. A window opens with a Report Viewer of a Running Report. Select any Row Data	on the Report. This will display information about the Account	with the same ID	that can be viewed on the bottom of the page. 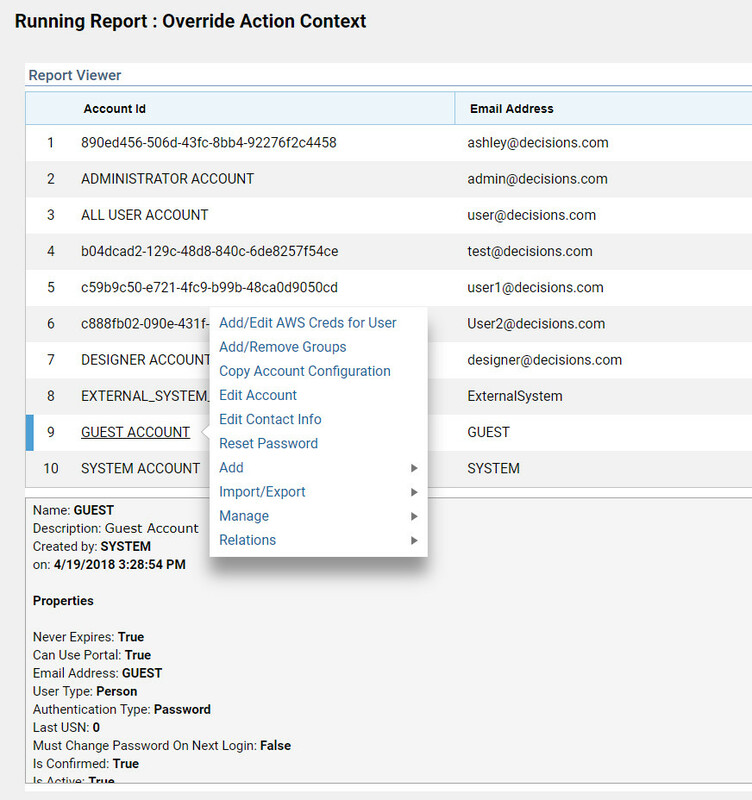 Right click any Row Data	on the Report to view available Account Actions.